Christmas tree crafts and activities will have your group singing O Christmas tree and our own simple Christmas song as they prepare for Christmas. (Open thematic poster-O Christmas tree) Print, laminate, and decorate the walls of your daycare with all kinds of posters. (Open educa-decorate-O Christmas tree) Print, cut out, and laminate. Use the illustrations to decorate the walls of your daycare and set the mood for the theme. (Open educa-numbers-O Christmas tree) Print and laminate the cards. Display them on a wall to decorate your daycare for the theme. 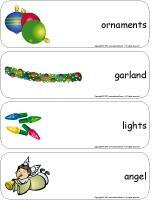 (Open educa-letters-O Christmas tree) Print and laminate the cards. Display them on a wall to decorate your daycare for the theme. 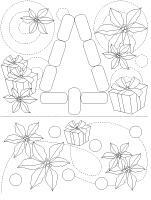 (Open garland-O Christmas tree) Print and cut out the Christmas trees. Assemble them to form a garland which can be used to decorate your daycare or cloakroom. (Open garland-Gifts) Print and cut out the gifts. Assemble them to form a garland which can be used to decorate your daycare or cloakroom. Make Christmas decorations with your group. Set a Christmas tree in a corner of your daycare and let children hang their decorations in it. You may add Christmas lights and light your tree during naptime. Display pictures of Christmas trees on the walls of your daycare. Hang a wreath. (Open my giant Christmas tree) Print and assemble the Christmas tree. Display it on a wall and decorate it with the decorations children make throughout the theme. (Open educa-circle time-O Christmas tree) (Open giant word flashcards-O Christmas tree) Print the questions and the word flashcards. Laminate them. Deposit the questions in a box and have children take turns picking a card. Spread the word flashcards out on a table in front of your group or display them on a wall. 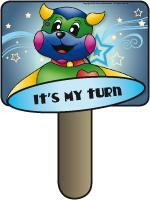 Print the "It's my turn" card. Laminate it and glue a Popsicle stick behind it. This card will help children respect the child who is speaking. If you prefer, you may use a puppet or stuffed animal related to the theme. The questions will help children develop their observation skills, vocabulary, thinking skills, cooperation skills, and give them a chance to practice waiting for their turn to speak. This tool will make circle time discussions easy for children of all ages and help you explore your theme. (Open Poni discovers and presents-Trees) Print the cards. Laminate and cut along the lines. Present the different types of trees to your group. (Open picture game-O Christmas tree) The pictures may be used as a memory game or to spark a conversation with your group. Use them to decorate your daycare or a specific thematic corner. Print, laminate, and store the pictures in a Ziploc bag or in your thematic bin. 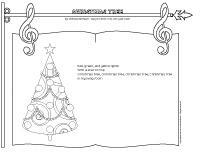 (Open activity sheets-O Christmas tree) Activity sheets are suggested for each theme. Print and follow instructions. (Open educa-connect the dots-O Christmas tree) Print and laminate the activity sheet. Children must connect the dots in the correct order to reveal the drawing. They may color it when they are done. (Open writing activities-T like tree) Print for each child or laminate for use with a dry-erase marker. (Open stationery-O Christmas tree) Print. The stationery can be used to communicate with parents, in your writing area, or to identify your thematic bins. (Open educa-nuudles-O Christmas tree) Print for each child. Have children color the sheet and use Magic Nuudles to give it a three-dimensional look. Variation: You don't have Magic Nuudles? Have children fill the spaces designed for Magic Nuudles with bingo markers or stickers. 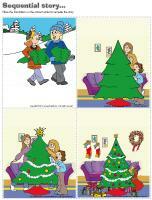 (Open sequential stories-O Christmas tree) Print and laminate the sequential story. Encourage children to place the illustrations in the correct order to recreate the story. (Open Christmas tree trimming scene) Print, laminate, and cut out the pieces. Let children arrange the items as they wish to create a scene. (Open game-This is my spot-O Christmas tree) Print two copies. Laminate and cut out the cards. Glue one copy of each card on the table using adhesive paper. Drop the other copies in a bag. Children take turns picking a card to determine their spot at the table for the day. You may also use the cards to determine naptime spots or for your task train. (Open my Christmas tree decoration path) Print, laminate, and secure the illustrations on the floor to create a path which leads to areas frequently visited by children such as the bathroom or cloakroom. If you prefer, the illustrations may also be used to delimit your various workshops. Cut tiny pieces of Christmas garlands. Divide your group into pairs. Children take turns gently touching their partner's feet, hands, and neck with a garland piece. This will help them relax and may even tickle a little too! Fill a container with Christmas decorations (unbreakable ornaments, garlands, etc.). Let children explore its content. Trace and cut out different sizes of Christmas trees (Open models-Christmas trees). Decorate them with glitter, lace, ribbon, cotton balls, confetti, etc. Glue the Christmas trees back to back on either side of ribbon or string. Hang the mobile from the ceiling. 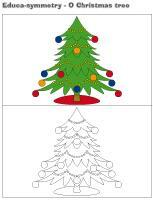 (Open lacing-Christmas tree) Print, laminate, and punch holes around the contour of each shape. Children can thread string, ribbon, or a shoelace through the holes. Use empty yogurt containers to build pyramids to represent Christmas trees. You can make small Christmas trees using individual yogurt containers and bigger Christmas trees using larger containers. Work together as a group or divide your group into two teams and have contests. Children will have fun building pyramids... and plenty of fun watching them fall down too! 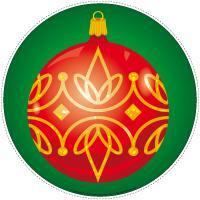 (Open Christmas tree decorations) Print, cut out, and laminate the Christmas tree decorations. Create an obstacle course and deposit decorations throughout. To the sound of music, children must complete the obstacle course. Each time, they must collect one decoration. When they reach the end of the obstacle course, children can hang the decoration in the Christmas tree (a real Christmas tree or a cardboard version). Children can start over again until all the decorations have been collected. 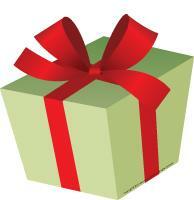 (Open models-Gifts) Print and cut out enough gifts to ensure each child has at least ten. Deposit all the gifts in the center of a parachute or blanket. Have children hold the edges of the parachute. When you give the signal, children must raise the parachute above their heads to send the gifts flying through the air. Children must collect as many gifts as possible. Once all the gifts have been collected, you may have children count them if you wish. Variation for younger children: Stand on a chair and let the gifts fall from above their head. Encourage them to collect as many gifts as possible. Purchase tiny plastic trees (used in miniature Christmas villages) and use them to create an obstacle course. Children must go around them as if they were cones, jump over them, or collect them. 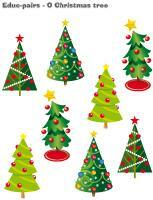 (Open Christmas trees galore) Print, laminate, and cut out the trees. Deposit them on your parachute. Shake the parachute to send them flying through the air. Children sit in a circle. To the sound of music, they pass an ornament or a Christmas-related stuffed animal around the circle. When the music stops, the child holding the object must choose his "task" (laugh like Santa Claus, paint his nose red like Rudolph, wear an elf's hat, open a gift while wearing mittens, etc.). Play the O Christmas tree song. Choose a child to play the role of the Christmas tree. The other children wrap the child with garlands. Take a picture of each child. (Open picture frame-Christmas) Have children cut, color, and glue the frame on a piece of cardboard. Each child glues his picture in the centre of his/her frame. 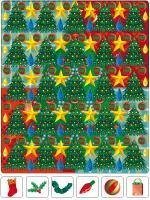 (Open color by number-O Christmas tree) Print for each child. Children must use the color code to complete the picture. (Open educa-symmetry-O Christmas tree) Print. Children must color the bottom picture to make it look exactly like the top picture. (Open educ-intruder-O Christmas tree) Print and laminate the sheet. Children must find the six objects which are hidden in the page. (Open educ-pairs-O Christmas tree) Print. Children must color identical illustrations using the same color or draw a line between them. For durable, eco-friendly use, laminate for use with a dry-erase marker. 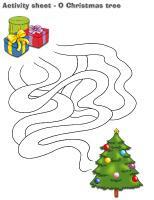 (Open educ-trace-O Christmas tree) Print for each child. Children must trace the lines using the correct color and then color the object at the end of each line with the corresponding color. Collect evergreen branches and let children explore their scent. You can also purchase pine essential oil in a natural health store. Present children with a few types of evergreen branches. Let them manipulate them. Provide magnifying glasses so they can observe them up close. Encourage them to identify the similarities and the differences. Place an ice cream cone upside down in each child's plate. Cover the cone with green icing and decorate with all kinds of candy pieces. If you wish, you can also spread white icing around the cone to represent snow. Press cloves into the orange until the entire surface is covered. For younger children, a clementine is a good alternative. Because it is smaller and its peel is thinner, inserting the cloves is easier. Pour the cinnamon into the Ziploc bag. Add the orange, seal the bag, and shake to coat. Remove the orange from the bag and tie a ribbon around it to make it look like a gift. Add another piece of ribbon to be able to hang it in the tree. (Open models-decorated Christmas trees) Print several copies. Use the models as a starting point for a variety of crafts or other activities. 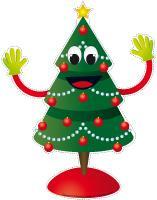 (Open puppets-O Christmas tree) Print the puppet models on cardboard. Have children cut them out and decorate them with a variety of materials. Glue Popsicle sticks behind each model to create puppets. 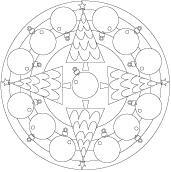 (Open mandalas-O Christmas tree) Print for each child. Children can color the mandalas as they wish. (Open miniature Christmas tree) Print, cut out, and color the pieces. Glue them on empty toilet paper rolls or Styrofoam drinking glasses to create miniature Christmas trees. (Open triangle Christmas tree) Print for each child. 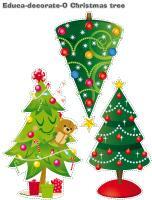 Children must cut out the triangles and glue them on a large paper to create a Christmas tree. Variation for younger children: Cut the triangles for little ones. Provide a model they can reproduce or simply let them glue the triangles on a piece of paper as they wish. (3D Christmas tree) Print the models and trace them on green cardboard. Paint an empty paper towel roll brown (if it isn't already this color). Use this empty paper towel roll to trace a circle in the centre of each cardboard circle. Cut this small circle out of each green circle (small, medium, large). Slide the circles over the cardboard tube, beginning with the larger one. Add a few drops of white glue to hold the circles in place. Decorate the tree by gluing colourful pompoms, beads, and decorations on it. Use heavy cardboard to form a cone and staple it closed. Decorate the cone with candy pieces, uncooked pasta, pompoms, confetti, etc. Variation: This activity can be done individually or as a group project. Simply make a larger tree if you are planning on decorating it as a group. (Open models-Christmas trees) Print. Trace a Christmas tree shape onto green cardboard. Have children cut it out and decorate it with cereal (Froot Loops, Cheerios, Lucky Charms, etc.). (Open models-Christmas trees) Let children paint on green (or clear) acetate sheets. Provide glitter and metallic confetti they can add if they wish. Trace a Christmas tree shape on cardboard and cut it out. Cut the centre portion out and keep only the contour. Glue the Christmas tree outline on the acetate sheet. Cut around the outside of the shape. Display in a window. You will need several cone-shaped paper drinking glasses. Have children paint them with green poster paint. Decorate them with colourful items. Glue the Christmas trees on a large piece of cardboard or in the bottom of large box to represent a forest. Roll a piece of green cardboard to form a cone. Decorate with ribbon, candy pieces, glitter, etc. Set your little tree on a table, on top of cubbyholes, or in a staircase. Trace a Christmas tree shape on a large piece of cardboard. Provide catalogues and flyers children can tear and crumple into tiny balls. Have them use the balls of paper to fill the Christmas tree shape. 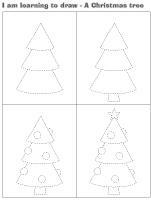 (Open models-Christmas trees) Print and trace the model on green cardboard. Cut it out. Fill the shape with white glue and have children press pine needles in the glue. Decorate. If you wish, you may also add glitter. 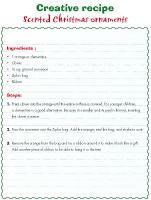 (Open scrapbook-O Christmas tree) Print for each child. Encourage children to draw the Christmas tree they decorated with their family at home or with you at daycare. 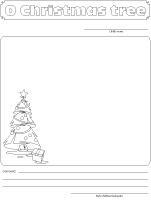 (Open I am learning to draw-A Christmas tree) Print and laminate the model sheet. Invite children to practice their drawing technique on the model sheet before trying to draw a Christmas tree on their own. (Open complete the drawing-O Christmas tree) Print for each child. Children must complete the picture by drawing the missing parts. 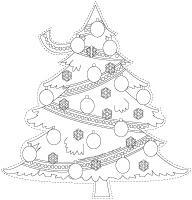 (Open coloring pages theme-O Christmas tree) Print for each child.